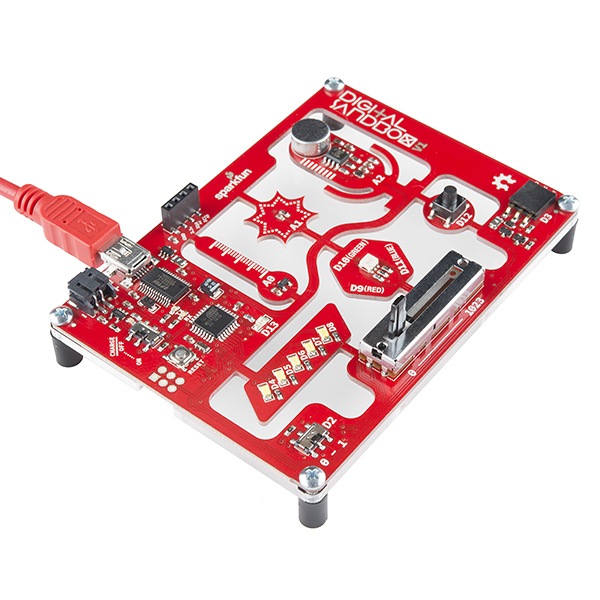 The Digital Sandbox is a newish board from Sparkfun which is a fun way to get started with hardware and Arduino programming. It has a variety of inputs (temperature, light, sound, slider, switch and a button) and outputs (LEDs and an auxiliary port which could be used to drive a number of different things like servo motors or a speaker among others). I made a Pd patch and Arduino sketch for the Digital Sandbox to talk to each other. This allows controlling the LEDs on the board from GUI objects in Pd and more importantly it makes it possible to create and control sound with the sensors on the Digital Sandbox. The download also includes a demo Pd patch which turns the sandbox into an instrument controller among other things. The demo patch uses the light sensor to control the pitch of a synthesizer. The slider controls a filter and button (D12) turns sound on and off. The switch is used to turn on or off an LED sequence using D4-D8. This demo uses the modular-muse library for Pure Data.